24th February 2010. 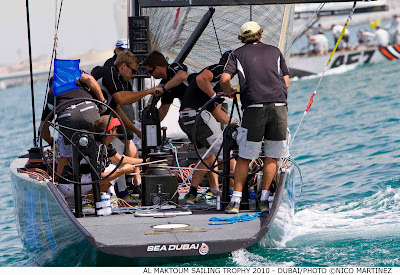 Al Maktoum Sailing Trophy, Dubai. Sea Dubai scooped the top match-racing prize today for the first time in their third season of racing in the class. The win was made particularly sweet by being the season opener, on home ground and so convincing after taking top place in seven out of their eight matches. Last season the team had mixed fortunes where they performed some stunning racing and amazing tactics but were let down by inconstancy and lack of confidence made them unreliable but ambitious. 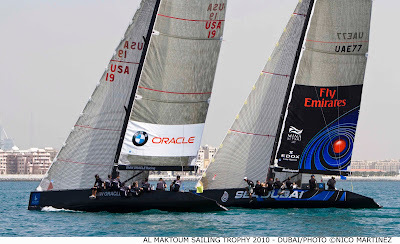 They had two matches today the first against Puerto Calero Islas Canarias where Sea Dubai managed to come from behind to win and the second against BMW Oracle, which didn’t go so well, and Sea Dubai lost their only match to Adam Minoprios Black Match team on the American boat. 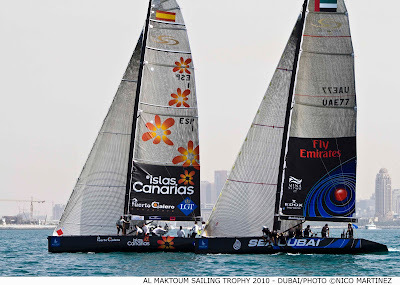 ‘To start the season on such a high like this is amazing,’ said Markus Wieser, the match-racing skipper of Sea Dubai. ‘We knew we could do it and thought we may be able to come 4th or 5th and now we are all a little bit surprised at how well we’ve performed this time. In the races today we were very conscious not to make any mistakes or cause any damage where we could lose precious points. We are absolutely knocked out with a first place result,’ he said. Tomorrow it is the turn of Raimondo Tonelli at the helm for the fleet racing. He is new to the team and only stepped on the boat just over a week ago. Whether he feels more pressure after todays win or less he is not sure but either way there is pressure. 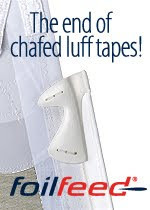 Hailing from Lake Garda in Italy where the wind can blow hard early in the morning he might find the conditions suit him this weekend, but as he’s more used to the foil sailing of a moth we will have to wait and see.